As he face Dong Hyun Kim at UFC 132 on Saturday in Las Vegas, Carlos Condit announced that if he wins over his opponent with an impressive performance he will request for a title shot. 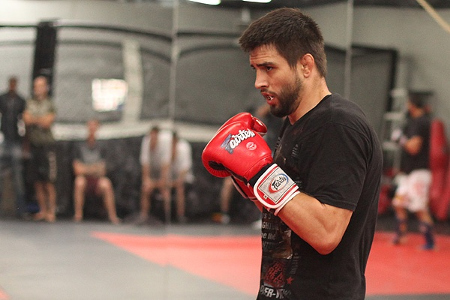 After waiting patiently for a long time, Carlos Condit calls for a shot at the welterweight championship title. However, he can do this if he defeat Dong Hyun Kim with an impresive and dominant win at the UFC 132. Condit, with a career stats of 26-5 will have to face Kim that have a career stats of 14-0-1 on the main card bout of UFC 132 that will be broadcast live on Spike TV on Saturday at the MGM Grand Garden Arena in Las Vegas. Even if Condit lacks of star power, he feels that he still have the momentum needed to have a big fight after being away from the octagon because of an injury that forced him out of the match against Chris Lytle at UFC 127. Condit said that he still trained even if his knee hurts to remain in shape. While his opponent, Dong Hyun Kim is not an easy hurdle to overcome. Kim’s Judo background makes him a formidable foe. Condit also added that he always want to be the underdog. He’s career is all about proving doubters wrong as he face every match with great confidence and performance.